Stand up paddle boarding is fast becoming one of the world’s most popular water sports, and with the versatility of this portable and lightweight board, you don’t have to sacrifice any other gear to bring it along. Small apartments, and smaller vehicles usually mean sports like Stand Up Paddle Boarding are out of reach and unreachable because of lack of storage space. NOT ANYMORE! Opening up a range of options for waterway exploration the Adventure Kings Inflatable Stand Up Paddle Board uses durable PVC outer fabric and grippy EVA deck grip and can be inflated from its compact size to fully functional in just seconds. The Adventure Kings Inflatable Stand Up Paddle Board comes with a neat carry back pack that has a pouch for the removable large fin and included high volume air pump for absolute portability in even small cars. Measuring a neat and tidy compact size of 850mm x 350mm x 320mm the stand-up paddleboard will fit in even the smallest cars on the market, and is so compact and lightweight it can be taken easily onto public transport. The heavy-duty construction PVC fabric combined with a clever ‘drop stitched’ internal lattice for extra rigidity and sturdiness on choppy water. This added stiffness also adds extra maneuverability on the water making the Inflatable SUP responsive to subtle rider inputs. 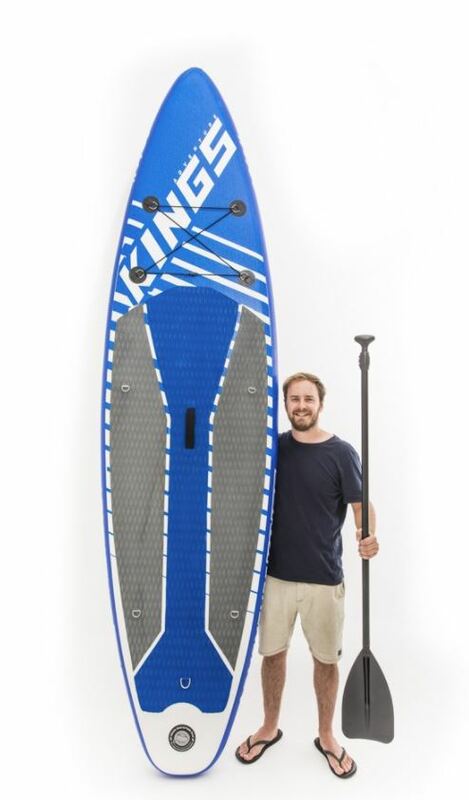 The Adventure Kings Inflatable Stand-Up Paddle Board also includes an adjustable height paddle, which can be adjusted between 1670mm and 2200mm for extra reach whilst standing or more compact for paddling whilst kneeling. The integrated cargo bungee on the front deck allows you to bring lunch or snacks and with the heavy duty carry handle you can maneuver the board easily and safely to the waters edge. Due to the lightweight and buoyant nature afforded by the 3200mm length and 830mm width and 150mm thickness, the Adventure Kings ISUP is easy to maneuver on and off the water and can even be ridden in extremely shallow water, unlike some kayaks and canoes this inflatable SUP has a draft of only a couple of inches, meaning it can float across the sand flats in style. The new Inflatable stand up paddle board is Australia’s new must have accessory for all families heading to the beach, it is easily stored and set up and offers hours of fun and exploration for years to come!